Dancing doesn’t always have to be serious. That’s what some of your favorite social media dance personalities bring to you in this video. 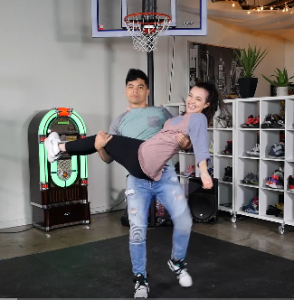 Ellen featured LA Choreographer Matt Steffanina, So You Think You Can Dance’s D-Trix and YouTube favs the Merrell Twins team up to try insane partner lifts. Matt paired up with Veronica, and D-trix with Vanessa. These lifts are so ridiculously hard they cant help but to laugh in the end. The video starts out with a monologue from the twins introducing the idea for the video. This includes them pairing up with each other and watching some hard ballroom inspired lifts which neither of them have tried with each other before, or possibly ever! After they chose team names the duos take turns watching lifts from their phone and trying them immediately after. Each time the level of difficulty increases and so do the scores. Matt and Veronica (Team RonMatt) seem to take it like champs tackling each trick after another. D-trix and Vanessa (Team MoppyJoe’s) are more in it to make us laugh. Every attempt by them is more and more humorous. The score ends up a 5-2 landslide making Team RonMatt the champs. If you need a good laugh today and break from all the seriousness in the dance world. These guys are ones to follow for sure. They are also just as talented as they are funny. The Merrell Twins are comedians/actors from Kansas City who moved to LA in 2013 in hopes of pursuing their dreams in the Entertainment Industry. They have come a long way since then. They were named YouNowers of the Year at the 2016 Shorty Awards and Best Live Show at the Streamy Awards. These girls have over 2 million subscribers and are known for their funny vlogs, product testing, and internet challenges. Matt Steffanina, from Canada, made his big break when featured on Ellen dancing his choreo to “Anaconda” alongside successful young dancer Taylor Hatala. Since then Matt landed a spot at Millennim, IDA, and ALDC LA. He has gained a massive following and is climbing his way up the industry latter for sure. Dominic Sandoval (D-Trix) is a Bboy from Roseville, California. D-trix made his way into the public eye (and hearts) when he made it to the top 8 on So You Think You Can Dance Season 3. Shortly after, Dominic competed on Randy Jackson’s America’s Best Dance Crew Season 3 with his team Quest Crew and became the winners. He returned to both shows as an all star for SYTYCD and judge for ABDC. Slowly making his social media brand grow, D-trix took his humor and charm to his social media turning him into an internet personality not just for dancers but everyone. Check out some dancing from Matt Steffanina Collabs a Fire Combo to Despacito!